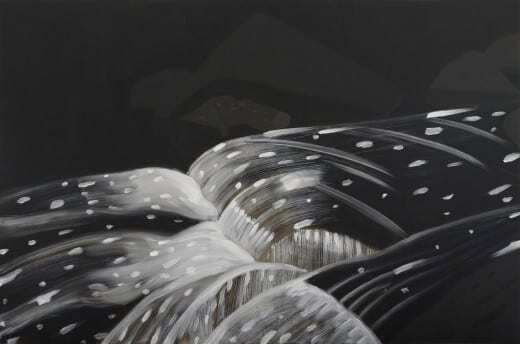 Alex Katz: Black Brook 11, 1990, oil on linen. Courtesy Peter Blum Gallery, New York. © Alex Katz/Licensed by VAGA, New York, NY. 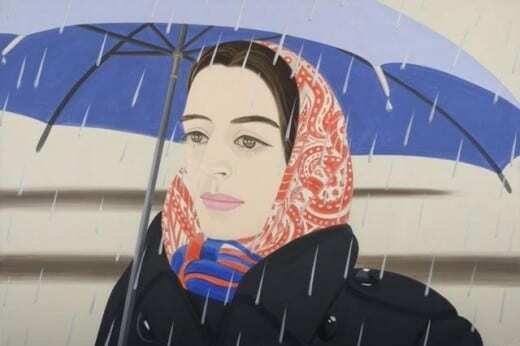 American post-war painter Alex Katz has built a 50-plus year career by locating the contemporary in traditional forms of painting. Emerging in New York in the 1950s and ’60s, Katz pioneered a distinct take on American realism with a flat, reductive style and cool edge. Now in his 87th year, he continues to push the boundaries of his signature look, testing the limits of what simplicity in painting can accomplish and what it cannot. His retrospective Alex Katz, This is Now, organized by the High Museum of Art, focuses on the presence of landscape throughout the artist’s career. On view through September 6, Now references Katz’s mission to seize the “immediate present,” or what curator Michael Rooks describes as capturing the “ineffable awareness of time’s passing.” Just as Monet caught varying stages of light in his haystacks series, Katz’s goal is to articulate an extremely precise moment. Katz’s traditional style evolved during the heyday of abstraction, and swimming upstream as a figure painter shaped him as a confident outlier early on. Even so, his painting philosophy was heavily steeped in a cauldron of American abstraction: Milton Avery’s modernized landscapes, “action” painting of the New York School and Color Field. Later, his hard-edged style and engagement with contemporary visual culture — graphic arts and advertising, for example — would help influence pop art of the ’60s. Firmly established in the canon, Katz’s brightly colored stylizations of American culture and society — its leisured landscapes, its fashion and beauty, how America is portrayed in postcards and advertisements — can be enigmatic in their intention. Katz insists his paintings aren’t political, ironic or twisting a playful knife on themes of commodification, consumption or celebrity culture. He is merely showing us the hours of his life. Similarly, his slick, graphic appearance doesn’t convey content; it is simply his style, according to the artist. In many cases, the work’s visual seduction overtakes befuddlement. His rhapsodic color harmonies, gigantic color swaths and defiant brushstrokes force an undeniable impact. They do what sculptor Richard Serra ascribed to Jackson Pollock’s paintings: come at you as if objects penetrating three-dimensional space. The sheer scale of some pieces reminds the viewer that painting can still achieve the sublime. In the exhibit, titanic landscapes like 10:30 am, Meadow and Winter Landscape 2, reduced to a mere handful of colors, saturate your field of vision, their resonance filling the gallery like echoing choruses. Each work’s implied extension beyond the canvas borders propels its surfaces forward. Katz achieves this effect especially well in January 3. The iconic Ada, his wife and favorite painting subject, stands before expansive wintry trees in Central Park, her lustrous cropped face interrupting time as if sequential film scenes collapsing together. Like Matisse, Katz prioritizes painting handling over achieving real human presence. His figures are often stylized with Rousseau-like flatness and mystery, “Etruscan in their inscrutability,” according to critic Andrew M. Goldstein of Artspace. Alex Katz: Blue Umbrella #2, 1972, oil on canvas. Courtesy Peter Blum Gallery, New York. © Alex Katz/Licensed by VAGA, New York, NY. Nonetheless, Katz also has an uncanny ability to evoke deep emotion that is surprising when it happens. Such is the case in Blue Umbrella #2, which emits a billowing aura around Ada that envelops the viewer in Katz’s own wonder when beholding the beauty of his beloved. Similar to Blue Umbrella #2, Summer Picnic and Good Afternoon represent a period in the late ’60s and early ’70s when Katz began honing his deft style to build up forms and create more particularity. Works from this period are among the most appealing in the exhibition, and suggest Katz’s influence on contemporary painters such as Elizabeth Peyton, or even Dana Schutz with their sense of color, place and particularized characters. There’s much more to latch onto visually; it’s quite easy to get lost in the details. Katz’s early landscape collages, easily overlooked in the first gallery, prove capturing appearance doesn’t have to be elaborate or studied or extremely large. It can be coarse and rudimentary — a handful of paper cutout shapes creating the illusion of figures at a distance on the beach, in this case. Katz’s later shift toward landscape, which he made deliberately in the late ’80s and continues today, bounces between two extremes: his signature fashioned stylization and a certain abandonment of thinking for perceiving. In these works, Katz prioritizes a phenomenology of sensations, anchoring them through paint. Many of the works featured were made in Maine where Katz has had a summer studio for decades, and where the artist first discovered his love for paintingen plein air. Without contest, his Black Brook series takes the show. Completed between the late ’80s through the early 2000s, these epic works present a churning, contemplative side. Painted from tiny segments of a creek in Maine and enlarged to mammoth size, they each reveal an attention turned both inward and expansively outward. Panoramic planes of blacks and browns, white rolling tides, flickering reflections in a dark void, these works travel to other dimensions, their gravity luring you in to their whirling abyss. In addition to their extraordinary visual impact, the paintings exemplify Katz’s aim: “It’s the instantaneous light, if you get it right then you get it in the total present tense, that’s what you’re going for, that’s eternity,” he says. In stark contrast, other landscapes in the show look stock or canned. Silhouetted trees before the setting suns make up Sunset, Sunset 1 and Sunset 3. Their rote appearance makes them nostalgic in a tongue-and-cheek sort of way, almost kitsch — like something you’d see airbrushed on a T-shirt at a touristy beach. It’s difficult to tell if Katz intends this ironic distance, or if he means them in earnest. 4:30 PM, a colossal seascape, is equally bewildering. Its cartoonish clouds and barely rendered boats are banal, as is the color palette. Similarly, the grandiose, thinly painted White Roses 9 feels almost manipulative in its overly simplified depiction of flowers — a quick sketch masquerading as a masterpiece. Such paintings exemplify the Katz conundrum, which English critic Mark Hudson sums up in the question: Is his work deceptively facile, or is it simply facile? Perhaps this is Katz’s intention. “I like to make an image so simple you can’t avoid it, and so complicated you can’t figure it out,” he says. It’s true. For all his straightforwardness, Katz is hardly easy, which also makes him a captivating egg to crack. The language he uses around his work is convoluted, abstract, and at times proverbially opaque. He rejects “subject matter” as a lens of interpretation of his work, prioritizing instead style, which he essentializes the way “action” painters did the spontaneous gesture, or the Impressionists the role of light. For Katz, personal style — that is, the literal handling of paint — is the actual content. What sets Katz apart from the long history of realism, as well as the great canon of abstractionists, is that, at his very best, he can achieve “realness” through a completely unexpected entry point — his pared-down aesthetic of broad strokes and giant flat planes of color, his subtle gesture and capturing of light. Katz, as Margaret Graham references in her catalog essay, actually disrupts the requirement that realism be anchored to a certain particularity of detail. Instead, details hit you from a distance. You notice his nuance as a broader sensation rather than as a point of specificity. An incredible feat with such economy of paint, when Katz hits it, he nails it.